Imagine getting lost in the psychedelia of Wes Anderson's baroque-pop style while eating a sinfully delicious dessert! 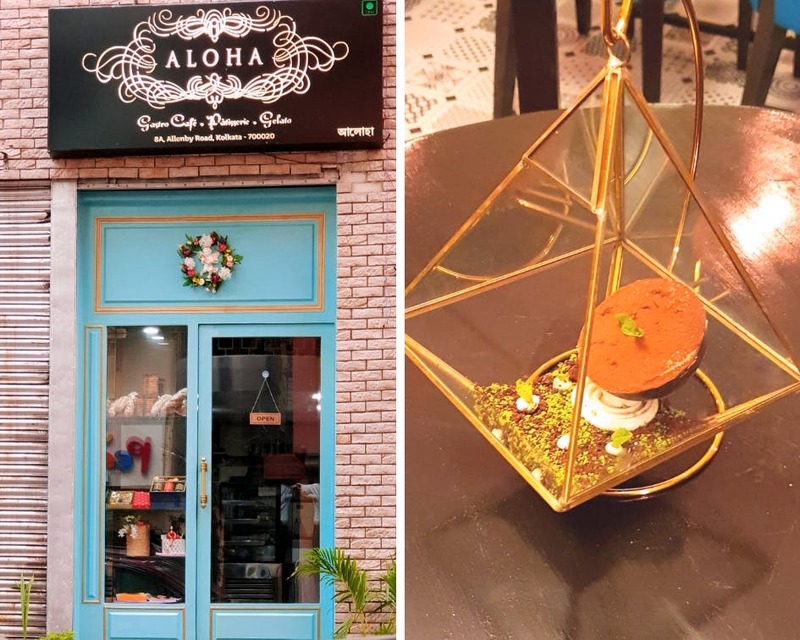 If you're giving all that a thumbs up, then you've got to head to Kolkata's newest cafe and patisserie, Aloha. There's a happening food hood coming up in central Kolkata that could soon catch up with south Kol's cafe hood (Hindusthan Park-Purna Das area). Allenby Road is packing some of the best pizza places and cafes in town. And to add to its fabulousness, new joint Aloha has just opened doors. You'll find it difficult not to get pulled in by its retro teal blue storefront that gives you a glimpse of well-crafted desserts and quirky interiors. Walk in and you'll get lost in baroque interiors, pop colours, golden art deco stairs, and retro geometric flooring. Sit on the mezzanine floor or on the spacious first, and get ready to try experimental vegetarian food (no, not an overload of tofu and paneer!) and gorgeous desserts. There's Japanese, Mediterranean, European and even American to pick from. Try the refreshing celery, mint and cucumber cooler to kick off fatigue in a jiffy. The charcoal fettuccine with its smoky flavours left us wanting more. If you want a taste of opulence, try their charcoal burger with 24k gold on top. Or the sushi that comes in a box full of drama with wood-chip smoke flowing out from its sides. The prices are definitely on the steeper side. Shakes and drinks are from INR 185, the food is from INR 350 and desserts are from INR 435. Run by siblings Richa, Kushboo and Praneet, this cafe houses their popular bakery Mushq World on the ground floor. From fresh breads to artisanal desserts, a range of gelatos (you've got to try their Bailey's Irish Coffee) and sorbets (the tequilla and lime is outstanding), this place is all about indulgence.